glaciate: I got around to finishing off the few changes I outlined in my todo list. 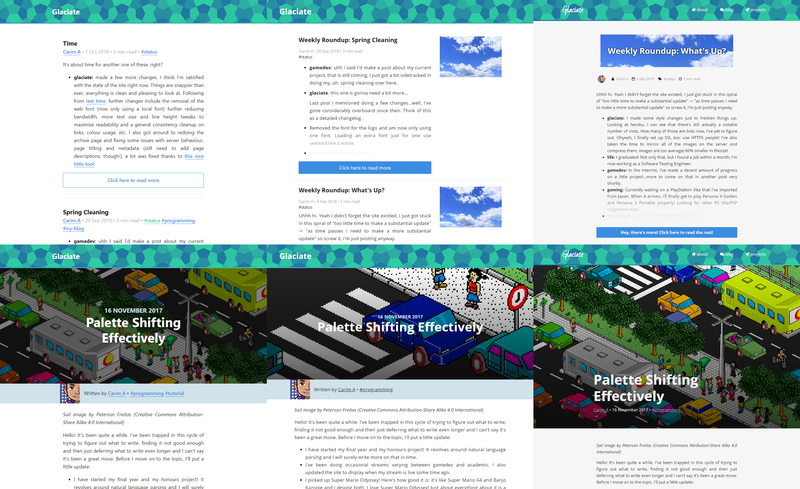 A huge change is that I refactored how the blog generated, which had the added benefit of making massive improvements to post previews (note that it actually shows a completed paragraph now rather than cutting in the middle of a sentence) and fixing bugs with post preview and the next/previous button. I also re-added (and restyled) the footer, and with it, I finally found a use for the middle! It now displays every tag that exists with a link to go straight to the associated tag index page. I also rewrote the archive page, now displaying only the information it needs to display and giving headings that are actually relevant to an archive page. gamedev: I'm really close to showing what I've got! Just doing some final image collation and writeups just to make things interesting from the get-go. At the moment, I'm doing some project refactoring which is allowing me to go through everything and write up about what's going on under-the-hood which will make for some interesting articles later on.